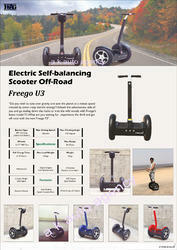 With desire to cement our reputation in the market, we are engaged in offering an excellent range of Freego Self Balancing Scooter (UV - 01 D Pro). 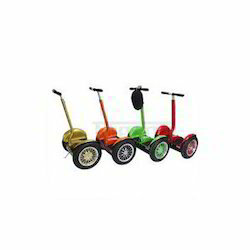 Our provider scooter is widely demanded by our customers for its optimum finish & smooth wheels. The offered scooter can be customized, as per the specifications of our clientele. This scooter is checked by our quality experts in order to supply a flawless range at user end. 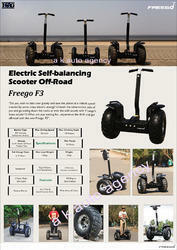 With desire to cement our reputation in the market, we are engaged in offering an excellent range ofFreego Self Balancing Scooter - Freego F3 - 48 Volt. Our provider scooter is widely demanded by our customers for its optimum finish & smooth wheels. The offered scooter can be customized, as per the specifications of our clientele. This scooter is checked by our quality experts in order to supply a flawless range at user end. With desire to cement our reputation in the market, we are engaged in offering an excellent range of Freego Self Balancing Scooter - Freego F3 - 36 Volt. Our provider scooter is widely demanded by our customers for its optimum finish & smooth wheels. The offered scooter can be customized, as per the specifications of our clientele. This scooter is checked by our quality experts in order to supply a flawless range at user end.